So, you have decided to do your own hair for your wedding day. Congratulations! This is a brave decision that will not only get all eyes on you (and your beautiful hairstyle) but will also make all your friends and relatives jealous of your DIY hairstyle skills. A few months before the wedding is a good starting point if you are planning on any hair color changes for the big day. Don’t make any drastic color changes, though, as you may not be able to get back to your previous color in time for the wedding. Different hair repair treatments for the last few months before the wedding will strengthen your hair and get you that hair glossiness you’ve been dreaming of for ages! DIY hair masks are all over the Internet, so just pick yours and you’re all set. While you are taking extra care of your soon-to-be bridal hair, go one step further and decide on your wedding hairstyle in advance. DIY tip: Don’t just fall in love with an already done hairdo as you may find it difficult to achieve the same look without being shown any steps on how to do it. Luckily, there are thousands of tutorials with steps in pictures and even videos online! Rehearse your wedding hairdo at least once before the big day to be sure you will look as gorgeous as you feel on your wedding day. There’s nothing that can ruin the perfect look of your bridal hair like split ends. A couple of weeks before the wedding hit the salon and get your hair cut. This will both make it look neater and will help you say goodbye to any split ends. Remember, that the secret to good-looking hair is regular trimming plus regular care! One of the pros of doing your own bridal hair is that you can experiment at home with your besties and/or family and get their true feedback. This will help you make the best decision and choose the hairstyle that not only you, but also the ones you love, find to be the perfect match to your overall bridal style. Why deciding on any DIY project (be it your bridal hair or anything else, for that matter) if you don’t afford yourself the freedom to add a personal touch to it? Follow the steps and watch the tutorials, but don’t be afraid to change a detail or two to add your own signature to your wedding hairstyle. DIY tip: You can add an accent like a flower, a feather, a statement headpiece or a delicate hairpin to accentuate on your individuality. 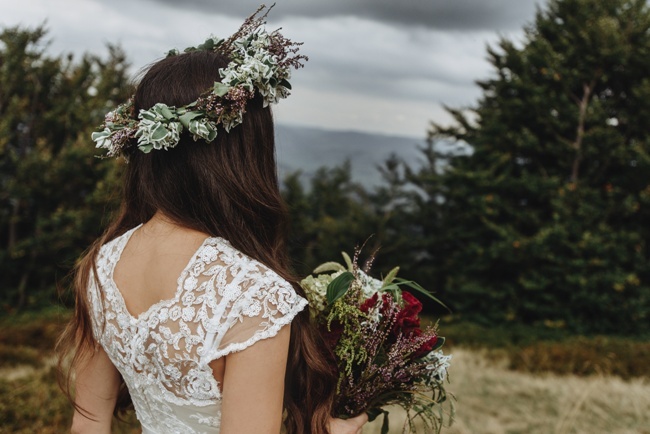 Some of the greatest wedding hairstyles are easy to make all by yourself: a loose updo, a tuck and cover French braid, the classy Hollywood waves and so much more. With so many tutorials online the hardest part of your DIY wedding hairstyle process will be to choose the best hairdo for your wedding!